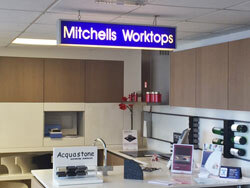 Mitchells Worktops Dorset customers are supplied from our Poole branch. 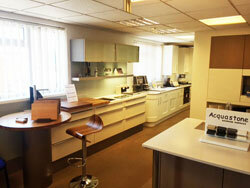 We have recently taken over The Worktop Warehouse in Allens Lane, Poole, formerly operated by Cobb Bros. With a wide stock of worktops and sophisticated CNC machining facilities for made to measure fabrication of worktops in Poole, Mitchells can now offer a full range kitchen and bathroom worktops to Dorset customers. Trade and retail customers are equally welcome. Whether you’re an experienced kitchen fitter doing your own worktop fabrication or a complete novice needing a made to measure worktop for a refurbishment project, we can help you with good stock, good service and sound advice. We can fabricate made to measure worktops in our fabrication workshop. Services range from simple cutting to length to fully machined mitre joints, undermounted sinks and drainer grooves. 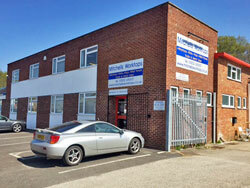 It's all in a day’s work for our experienced staff! 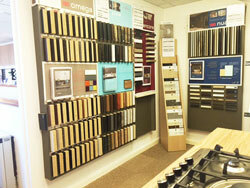 Visit our showroom to see a full range of colour samples for all the ranges we supply. You can also see examples of our worktop fabrication work and see the range of worktop accessories available from the Worktop Warehouse in Poole. 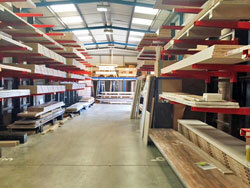 Our Dorset worktops showroom, warehouse and workshop are all on the same site in Allens Lane, Poole just a few minutes off the A35.